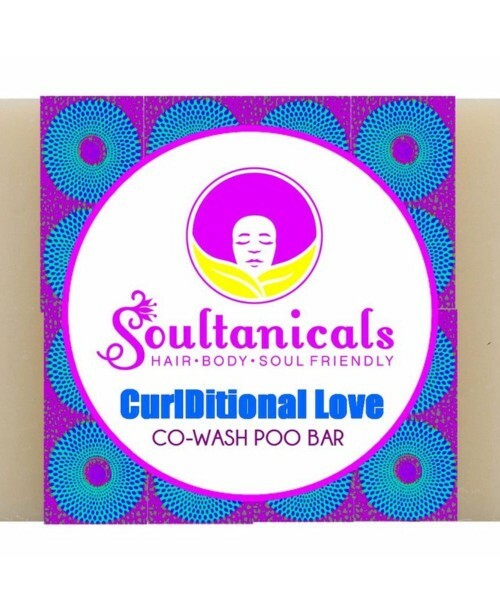 This Conditioning Co-Wash poo bar is specially formulated to cleanse, condition & detangle at the same time. Full of Wash Day worthy goodness, this bar will remove product buildup & increase strength & shine. CLEAN-CONDITIONING INGREDIENTS: Saponified Oils of Coconut, Palm, Safflower, Vegetable Glycerin, Purified Water, Stearamidopropyl Dimethylamine, Behentrimonium Methosulfate, Cetyl Alcohol, Rice Bran Oil, Silk Protein, Sodium Lactate, Panthenol, Centimonium Chloride, Hydroxypropyltrimonium Honey, Sorbitol (moisturizer), Sorbitan Oleate (emulsifier), Soy bean protein (conditioner), an extra lather of soulistic flava & LOVE! Rub the soap into your wet hair. Massage scalp to produce a nice creamy lather. Detangle with a wide-toothed comb or detangling brush.